Named after the Knights of Malta, also known as the Knights Hospitaller, who had a commandry, church and infirmary here. The lake is known for major kayak and rowing events. It was created by damming up the Cybina River and covers an area of 64 hectares. 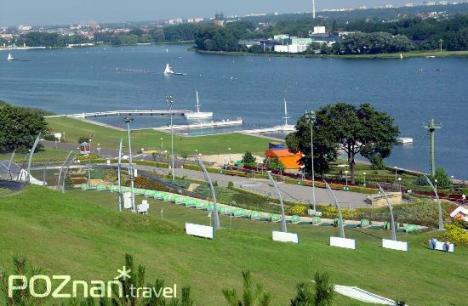 The regatta course (one of the best in Europe) is 2190 metres long and from 170m to 400m wide. The western part of the lake features the largest fountain in Poznań built to commemorate the 750th anniversary of the foundation of the city. Hidden underground along the north-west bank of lake are thermal springs; there are plans to use them during the scheduled construction of an aqua-park. The narrow-gauge track of the Maltanka children's train runs along the north shore to the Zwierzyniec end station located near the Wielkopolska Zoological Gardens (the New Zoo). The south bank features an all-year ski slope and a toboggan-run on Wolności hill. Located at the foot of the slope is a driving range and a mini-golf course; there is also a bathing beach nearby. In summer Lake Malta features open-air performances during the International Theatre Festival. In winter a skating rink opens on the west bank of the lake.